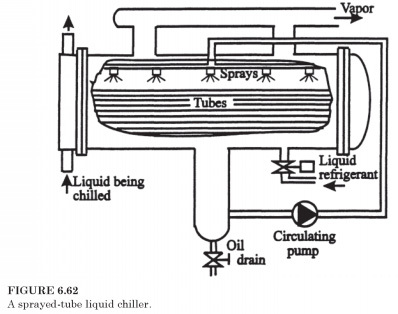 In the concept of spray chillers, as shown schematically in Fig. 6.62, instead of immersing of a tube in the liquid, as it is done in conventional shell-and-tube evaporator refrigerant liquid from the pump is sprayed over the pipes. Working level of liquid refrigerant in the evaporator is maintained below the bottom of the tube. The idea of the gun tube evaporators is not new, and although the overall heat transfer coefficient of the sprayed-tube evaporator, as a rule, exceeds flooded type, the additional complexity of the pump and spray Assembly, as a rule, discouraged designers of their choice. In recent years, however, and other power-spray evaporator tube appeared in importance, and that feature is the low refrigerant required. Improvement of heat-transfer coefficient in comparison with the flooded evaporator is because the spray tubes allows to easily escape of steam bubbles that after they form, insulate the heat transfer surface. In fact, there is an optimal circulation rate in sprayed-tube evaporator, which brings maximum boiling factor. When the flow rate is too high, the liquid film becomes dense and pipe insulation. When the flow rate is too low for some surfaces of pipes not be wetted. Typical treatment rate30 is 5-fold amount of the evaporated. Pump adds a small amount of the cost of electricity, and if the pump is not evaporator, in fact, with the operation. Often the pump becomes part of the device. Reduction of the refrigerant charge is an objective in terms of costs in the case of Halocarbon refrigerants or for security purposes in the case of ammonia. As comparison30, flooded chillers with a refrigerating capacity 1407 kW (400 tons of refrigeration) will require ammonia 5900 kg (13,000 lb), while the sprayed-tube evaporator requires a total of 159 kilograms (350 lb). Liquid leg, that ensures an appropriate static pressure at the inlet of the pump contains a lot of refrigerant.